Originally a mid-level bureaucrat working for the EPA, WALTER PECK visited the GHOSTBUSTERS for a routine check of their equipment, and met PETER VENKMAN for the first time. Their personalities clashed immediately -- Peter insulting Peck's intelligence, and Peck returning the gesture, refusing to refer to Peter as "doctor". Peck shut down the containment unit, and discovered how dangerous this work actually was -- and how necessary. 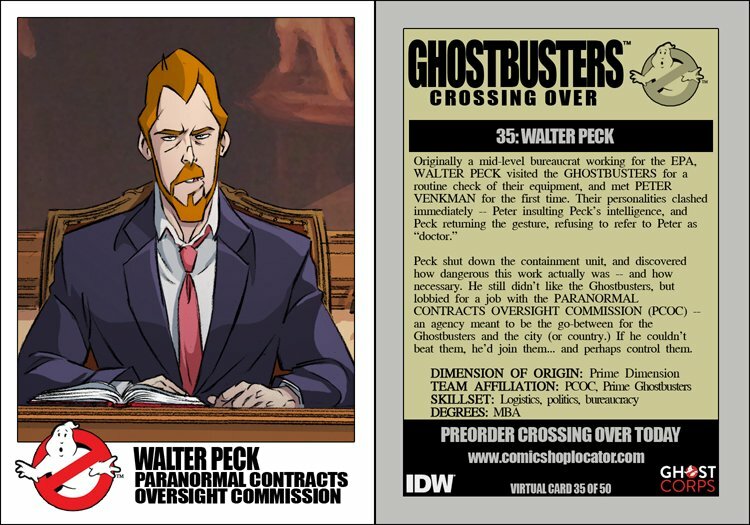 He still didn't like the Ghostbusters, but lobbied for a job with the PARANORMAL CONTRACTS OVERSIGHT COMMISSION (PCOC) -- an agency meant to be the go-between for the Ghostbusters and the city (or country). If he couldn't beat them, he'd join them... and perhaps control them.